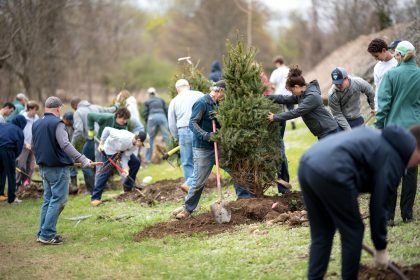 A time to plant: Smith Richardson volunteer work day: 1,105 trees and shrubs planted! Our volunteer day at the Smith Richardson sanctuary in Westport on Saturday, November 3, was a huge success. Thank you to all the hard workers! Well over 100 people turned out, including a group from the Staples High School’s Service League of Boys (SLOBS) and the Builders Beyond Borders organization from Norwalk. And then on Monday, November 5, another group planted 50 larger spruce and pine trees. In previous Novembers, volunteers gathered by the dozens to clip vines and clear invasive species. All told, the work is a huge part of the transformation of the 36-acre section of the preserve into one of the best coastal habitats in Connecticut. Major support for the project comes from the Long Island Sound Futures Fund/National Fish and Wildlife Foundation. Forger and Kunkel, Planet Fuel and Patagonia also made essential contributions to the project. The Smith Richardson preserve is on Sasco Creek Road in the Greens Farms section of Westport. Use this map for directions. The preserve is open to the public for hiking. Since August, numerous birders have been there to help document the preserve’s growing importance for wildlife. Click this link to read more about how the work is transforming the preserve. 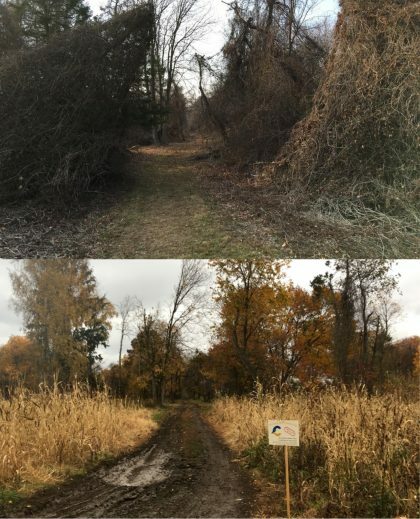 These before and after photos, taken by Stefan Martin, show the tangle of invasive vines (porcelain berry, mile-a-minute weed, bittwesweet) along the side of a trail and then the newly-planted trailside of millet sorghum and other seed-producing plants that birds love. It’s hard work but it’s always fun. We held a very successful volunteer planting day in April. Take a look at this four-minute video to get an idea of what was accomplished.